Modine PTC high efficiency unit heaters for garages and commercial buildings. 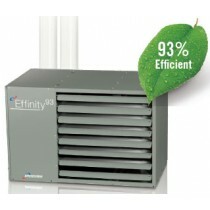 PTC Effinity heaters are 93% efficient and easily vented with PVC pipe. 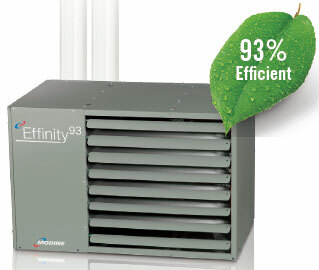 With six models available - from 135,000 to 310,000 BTU/hr - all operating at 93% efficiency, the Effinity93 will dramatically lower energy costs through decreased gas/propane consumption. For those looking to feel even more green, each unit will reduce CO2 output by roughly 13% versus comparable sized heaters. Modine's exclusive Conservicore™ technology relieves your fear of failure thanks to its ability to withstand acidic condensate. A design that was made with contractors in mind for faster installation and lower installation costs. Product line that's built off the successful PTS-model footprint; all Effinity93 box sizes are equal to a corresponding PTS model. The Contractor Convenience Package is standard on all units, allowing for easier connectivity and troubleshooting.